Mestia, in the Svaneti region of Georgia in the Caucasus, can only be described by clichés; unforgettable, unique, unspoilt, astonishing. It’s Georgia’s version of Brigadoon, looking as though it only emerges for a few days every hundred years. Until Christmas Eve, 2010, the only way of getting there was over three hours’ travelling up a hair-raising, unsurfaced mountain track, weather permitting! It’s classed as one of the most dangerous roads in the world, with a sheer drop down one side and danger of falling rocks on the other. Bad weather can make visibility almost nil within a few minutes and it’s impassable for several months a year because of snow and ice. But now they have an airport for small planes, weather permitting! I’ve passed my pilot’s exams, so as Canadian pilots Mark and Dusty manoeuvred through the Caucasus Mountains preparing to land, I decided it was better not to tell the other passengers what a wonderful feat of flying they’d achieved! The tiny L-shaped airport has a security machine that takes up half the building! We were politely but firmly put through the usual procedures, although we were the only passengers that day. Then we dragged our cases down a bank of dirt and outside on to the tarmac-free ground. Now and then we met another vehicle, creating a Svan traffic jam. They seemed unsure about how to overtake or pass each other. We would sit patiently (and confused) while they talked and shouted, with lots of arm-waving, discussing the best way to deal with the situation. Once, a third vehicle came along, and that really created mayhem! The weather was hot, despite the fact that we were about 1800mts (nearly 6,000ft) above sea level. We stopped to buy some water in a small, but well-stocked supermarket. I thought about the difficulty of delivering supplies to this remote town. It’s a 12-hour trek from the capital city of Tblisi. Our minibus laboured up a steep hill as far as it could go. Then everyone got out to visit one of the medieval towers that are dotted around the mountains. For some reason I was feeling a bit queasy, so I decided not to go with them. I perched on an uncomfortable rock in the shade, gazing at the stunning views. Snow-capped mountains circle the town. Tiny houses peep out amongst the greenery, with the strange ancient towers dominating them. Absolutely beautiful. We were told that sometimes through the centuries, there was fierce fighting between the villages, plus several invasions from outsiders. When that happened they would lock themselves in the towers with their animals and stay there until it was safe to come out again. Apparently there is gold somewhere in the mountains. Tradition says that Jason and the Argonauts came to Svaneti, searching for the Golden Fleece. Like most myths, there is truth hidden in the tale. The original prospectors used to pan the gold in the rivers using a fleece to catch it. Two men walked down the hill towards me. One led an ox and the other had a wooden plough slung over his shoulder. They stopped beside me, completely ignoring me and one of them gently pulled ticks off the ox, who patiently waited. I felt as though I was invisible, watching a ghostly scene from the past. As they walked along in front of me, they nodded and obviously said hello. I said, ‘Hello,’ clearly. A young boy of about 10 appeared from a nearby house and looked at me as though I was an alien from Outer Space. He was wearing a red Beckham No 7 shirt – in an isolated mountain town with no shops! Ignoring me, he played around me, carefully walking along the fence with his back to me, showing off. Then he jumped down and stared at me again. ‘What’s your name?’ I asked him. ‘My name is Sandrine,’ he said. After a few more minutes, he stood in front of me and slowly asked, ‘How old are you?’ ‘I am 21,’ I lied with a smile, which confused him. A voice called, ‘Sandrine!’ and he ran indoors. A few minutes later, three women marched towards me with Sandrine in front of them. Oh dear, I’m in trouble, I thought. I’d read a few tales about the fierce mountain people. Maybe I shouldn’t have talked to their boy. The first woman half-pulled me to my feet by the arm. ‘Come. Eat,’ she said, and they dragged me to their house. Protesting was out of the question. I was a bit nervous, but I wouldn’t have missed it for the world! Sandrine’s father or uncle was on the balcony, fixing up a satellite dish. He waved. We passed the wooden outside loo. It had a shower above the toilet, where they also filled the washing-up bowl. The kitchen had a wooden floor, one of those 1950s cabinets with a drop-down front, and a basic black cast-iron stove which they were cooking on despite the heat. An open doorway let through to the stables where our sitting-room would be. Extra warmth in the bitter winters. I was cuddled and dragged through to the next room, with Sandrine smirking because he’d found me! Beds lined two of the walls, and a sofa stood along the third wall. Asleep in one of the beds was Sandrine’s elder brother. He didn’t stir the whole time I was there, despite all the noise around him. A sink with taps but no running water and some kitchen units were fixed behind the dining-room table. Sitting at the table, I was offered dish after dish of food. Remember that I was feeling a bit delicate. First came a solid cake-like savoury dish that I was told was Russian. I think it was couscous, but made with milk. Then there was a plate of watermelon chunks, and a mug of matsoni, which is a simple, home-made yoghurt. I was offered a large slice of a freshly-made flat bread, but I was put off as Sandrine’s baby brother was sitting on a lady’s lap and playing with it, chewing on the edges while everyone smiled approvingly. Finally, there was a mound of tiny, perfectly made meringues, like teardrops. Sandrine’s mother checked the answerphone messages. His father or uncle (they looked identical) spoke a few words of English. He introduced me to the family. 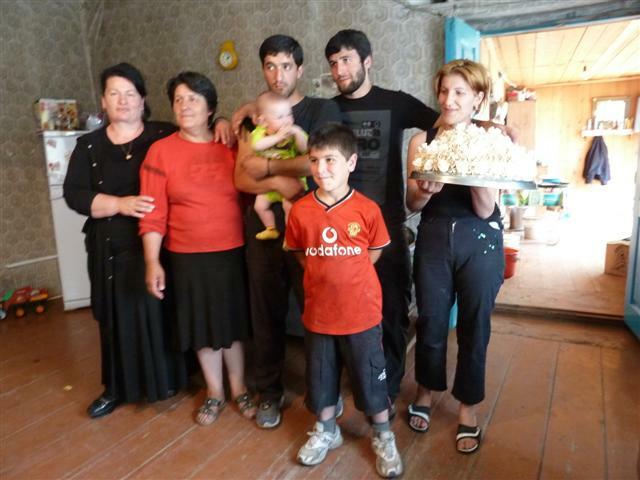 There were two aunties, an uncle, the grandmother, Sandrine’s parents, Sandrine and his two brothers. English is taught in Sandrine’s school. There are only 12 pupils. I asked if I could take their photo and they looked afraid. There were no photos in the room. But they reluctantly agreed. When I showed them the photo on my camera, they became more enthusiastic and willingly posed for me again. The others came down from the mountain. Sandrine and his father went with me to meet them. Mako, our Georgia guide couldn’t understand anything they said to her as they speak a completely different dialect. I gave Sandrine a pen. I told him it could only write in English! He was delighted. Back in the minibus, we slowly battled our way through the town, dodging cows, traffic (the odd car or lorry) and potholes. We went over a rickety bridge across a gorge. Only one vehicle at a time can go on it, and it swayed a lot. Lunch was at the isolated Hatsvali Guest House. The Georgians serve dish after dish, like huge tapas; far more than any of us could eat. I sat at the head of the table and looked at it all with horror. I was completely stuffed. Looking around the restaurant, I wondered how on earth they got everything up there; chairs, tables, chandeliers, tablecloths. There were no shops, and the road wasn’t exactly the M25! As we left the hotel, I could see clouds rapidly gathering in the distance and flowing between the mountain peaks, and I wondered if we would have to spend the night in Mestia. I hoped so. After shaking and rattling along to the airport, and almost losing our exhaust on rocks, we went through Security again. What on earth did they expect to find? A cow up my dress? Oh well, it gave them a chance to practise. Our little DHC-300 Twin Otter plane galloped along the runway and we had a rather turbulent flight through the cloud-covered mountains to Batumi, calmly controlled by the unflappable Mark and Dusty. This is the hardest article that I’ve ever had to write. 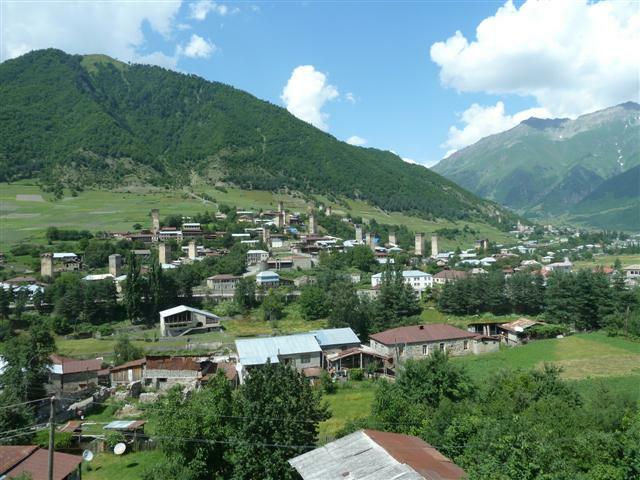 I know that the Svaneti population lives in virtual poverty, mainly relying on agriculture. They have been practically cut off from the rest of the world for centuries. They’re looking forward to tourism and a better standard of living. There is a lot of building going on, funded by the Georgia Government. But nobody will ever again visit the Mestia that I saw. I feel privileged to have seen it. It will soon be completely changed. As it becomes more accessible, the tourists will go there. Will they appreciate the simple ways of the mountain communities? Some locals will become rich, others will remain poor. They will learn jealousy, anger, greed, and petty crime will almost certainly follow. As I sit here in front of my computer with the heating on, I know that I have no right to want the Svans to stay the way they are. But I do. I don’t want Mestia to change. It’s a living piece of history, locked in a time-warp. If only it could remain like that for ever! For an absolutely unforgettable experience, do go to Georgia and visit Mestia. But go soon – and don’t tell anyone about it! Plain yoghurt. Greek yoghurt will do. When there’s about an inch of yoghurt left in the pot, top it up with milk and stir it. Cover the top and place the yoghurt pot somewhere warm for a few days, in the sun or in the airing cupboard. The Georgians like their matsoni runny, but I like it thick. After 2-3 days it will be thick and set. Do the same thing again when the pot is nearly empty. Wash the pot and pour the yoghurt/milk mixture back inside. Hi Lyn, I ve read your post about Mestia and I want to say don’t worry, we Georgians remained our culture and hospitality through many centuries, fighting against overwhelming odds. Since 1st millenium BC the Greeks, Romans, Persians, Arabs, Seljuks, Mongols, Ottomans and Russians have tried to posses our land , but they ve never done that… Of course some people are changing after getting more income and stuff , but as a Georgian I can say that there are still people even in Tbilisi that are hospitable . for instance I make wine already 9 years and often inviting tourists to my house to degustate it…. « The 2nd Siege of Malta!